One of my knitting goals for this year is to finish some projects that are already started. One of those is the Maryland Socks which I started on the plane on my trip to Maryland last summer. There were two things that were the focus of the trip: the Allman Brothers/Santana concert and a visit to the Sharpsburg area to see the Antietam Battlefield. In school I learned some about the Civil War, but it was more of an overview, not a lot of detail. Before the trip I watched Ken Burns' Civil War PBS series and wanted to know more, and I'm continuing to learn. 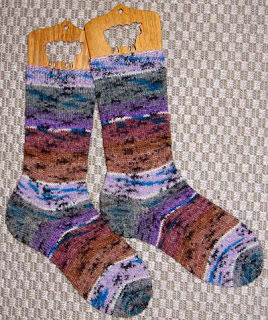 Even though it took more than seven months from start to finish, perhaps it's fitting that I completed these socks last night while watching a series I had recorded: The Abolitionists. Excellent shows, by the way. I look forward to continuing to learn. My first pair of finished socks of the year!